Wow! It was almost like having a whole week of spring weather! The garden is looking good, especially the tomatoes. We’ve had 2 years of tomato troubles here in the Demo Garden, so I’m happy to see normal growth and some flowers starting. The garden doesn’t look that much different than last week, other than that hint of purple over in the herb garden where the sage is in full bloom. Here’s a closer look at the sage. It is looking beautiful! 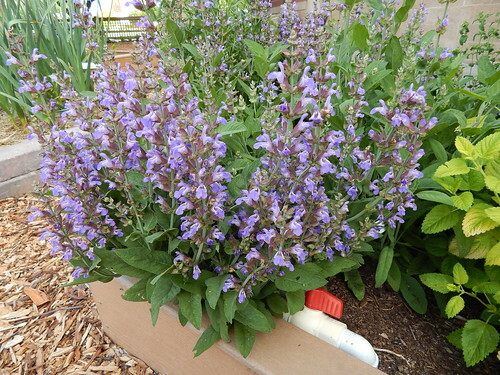 I love the purple next to the gold variety of Lemon Balm. 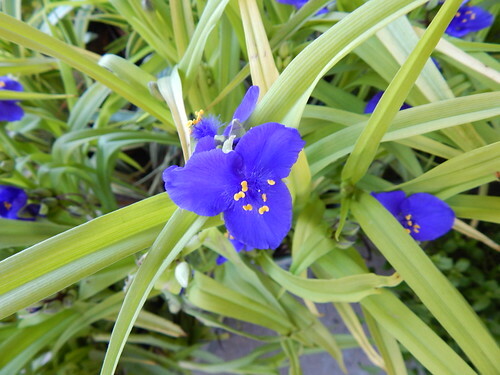 One of the Spiderwort that was planted in the new Shade Garden this week. 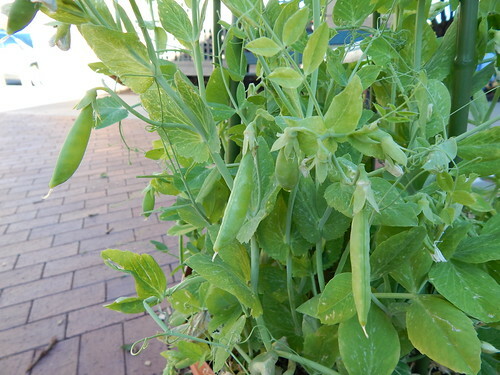 The container of sugar snap peas in the Kids’ Snack Garden is starting to have some peas. There definitely aren’t enough to do much with, except grab one for a snack, of course! 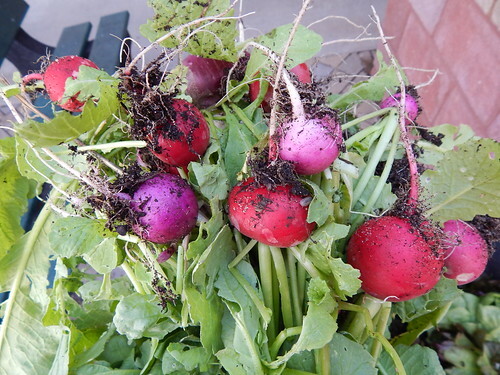 We pulled the Easter Egg Radishes and the lettuces from the Kids’ Snack Garden this week. They were a lot bigger than I usually let the radishes get. Some of them were probably a little bit woody. We’ve got tomato flowers! I’m just starting to see a few flowers on the determinate varieties and the cherry/grape varieties. 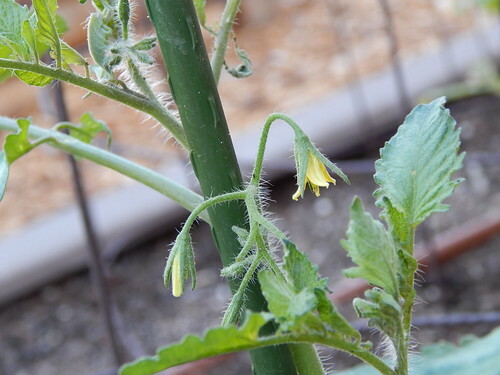 Not surprisingly, the heirlooms and the ones with longer days to maturity don’t have any flowers (or buds) yet. I’m really hoping for a good tomato year! 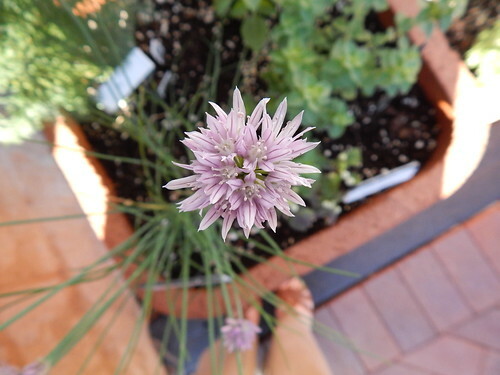 We have chives in one of the herb containers this year, and it is blooming as well. I guess the theme today is purple and blue flowers, huh? Since the plant is small, the flowers are pretty small yet too. 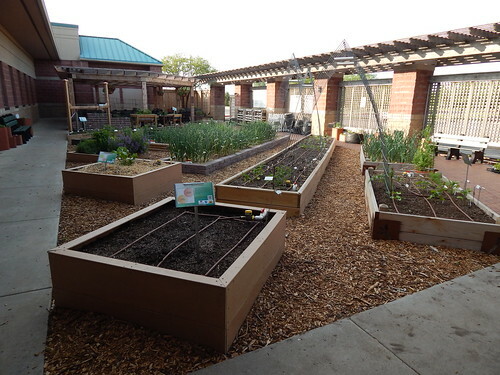 Posted on May 24, 2013, in PhotoEssays and tagged flowers, herbs, peas, shade garden, Tomatoes. Bookmark the permalink. Leave a comment.